In a Dutch oven, cook the beef, onions and green pepper over medium heat until meat is no longer pink; drain. Stir in the remaining ingredients. Bring to a boil. 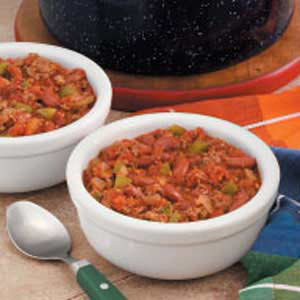 Reduce heat; cover and simmer for 1-1/2 hours or until flavors are blended. Yield: 11 servings.